In 2014, the Church of God was reintroduced to the Shelter at the Church of God Convention. That year, the ministry, which began housing unprotected orphan girls a hundred years earlier, held a grand celebration of God’s goodness and provision. At the same time, the Church of God rallied around the Shelter and Church of God Trafficklight in the preventative role it plays in the fight against trafficking. A few years have passed since the spotlight was shone brightly on this life-giving work in Cuttack, India, but now they’re gearing up for another celebration with similar significance. This November, the Shelter Primary School, on the same grounds as the Girls Shelter Home, will set aside three days of centennial ceremony and activity to commemorate its impact on the church and community. A review of the history of the Shelter isn’t complete without consideration of the political and cultural climate that surrounded its inception. Until the late 1800s, the education of women was a low priority at best. As preconceived notions and prejudices began to subside, acts of government in India began to open up opportunities previously closed for women. John A. D. Khan first arrived in Cuttack in 1905, and discussed with other pioneers of the Shelter the great need for a means to educate and care for unprotected minor girls. Sonat and Nolini Mundal, as well as Faith Stewart, would arrive in Cuttack by 1914, when a one-story home for such girls would open. They would be soon serve as three of the earliest teachers for the school. Then, in 1916, the formal establishment of the school came to pass. 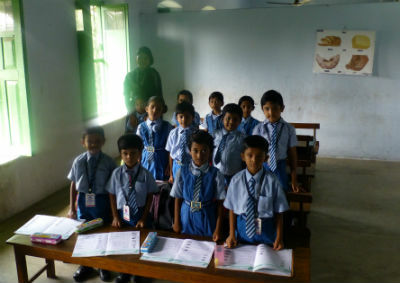 Photo: One of the classes at the Shelter Primary School. Fast forward to 2017: 401 students receive education and spiritual formation from the ten teachers of the vital institution. Not only does the school educate the girls who call the Shelter their home, but also boys and girls from the neighborhood. The school is privately owned, but considered public, as costs are shared. Don Armstrong, regional coordinator for Global Strategy to Asia and the Pacific, explains: “The students walk to school in the morning, then the government provides a lunch for the students so they don’t need to go home. Going home for lunch had been the custom, but it was discontinued when it was shown that most kids never received a lunch at home.” While the government also pays the teacher’s salaries, the church is responsible to provide the teachers and maintain the buildings. Unlike the United States, school days are Monday through Saturday (10:00 AM until 4 PM, Monday–Friday; 6:30 AM until 10:30 PM, Saturday). The Shelter Primary School offers first through fifth grade education. Though lack of finances prevented the celebration of the centennial of the school in 2016, the chance to observe the special occasion has finally come into view. From the 15th through the 17th of November, special worship services, community activities, and presentations by local dignitaries and politicians will highlight the three-day event. Learn more about Global Strategy and giving opportunities at www.chogglobal.org. This entry was posted in All Church of God, CHOG TraffickLight, Global Strategy and tagged 100th anniversary, A. D. Kahn, Asia and the Pacific, Asia-Pacific, Centennial, Cuttack, Don Armstrong, education, Faith Stewart, girls, global, home, human trafficking, India, international, Shelter Primary School, Sonat and Nolini Mundal, The Shelter. Bookmark the permalink.